The celebration included live music, dancing, fruit punch, cake, ice cream and certificates of recognition from state Sen. Tony Avella. Each of the exquisitely dressed honorees was invited to share a few words. Gratitude was a common theme in their brief reflections. Queen of Peace is in a residential neighborhood at the eastern edge of the New York borough of Queens. 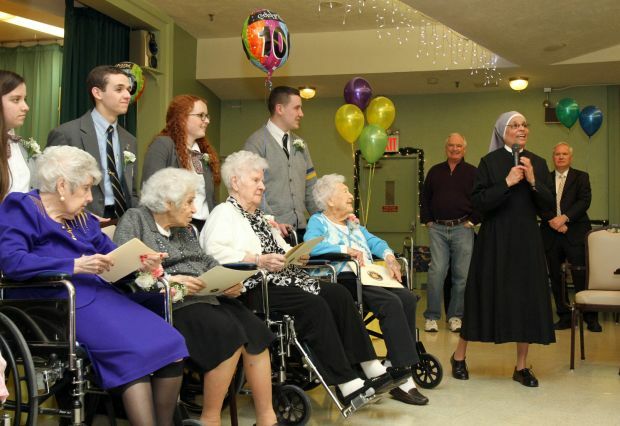 The Little Sisters of the Poor opened the facility in 1970 and have cared for 1,240 elderly men and women there, including the 81 current residents. Twenty sisters and 95 employees serve the residents, with help from volunteers and young women in the Little Sisters’ novitiate, which shares the compound. Sister Sheila McLoughlin, the director of nursing, said Queen of Peace differs from other nursing homes because of the charism and spirit of the congregation and the way the sisters work together with employees, volunteers and residents to create a family spirit. “Everyone can take care of somebody, but if you’re grounded in faith, you’re also serving the Lord,” while you’re working, she said. The sisters also take a vow of hospitality, which permeates everything they do, she said. Queen of Peace includes 28 independent living apartments and 53 single rooms with private baths in a skilled nursing environment. There is an infirmary in the building and residents are taken to the hospital, “if they will get well,” Sister Sheila said. There is a tender focus on end-of-life care, manifested in a commitment to never leave a dying resident alone. Most residents are Catholic and Mass is celebrated daily in the two-story chapel. “The majority come to us because they’re Catholic and want to be with the sisters and have someone praying with them when they’re dying,” she said. Frost, a trained gerontologist with experience as a nursing home ombudsman, said the dignity and respect she saw at Queen of Peace made it easy to recommend it to her mother. “On my very first visit, I was impressed that there was no odor and everyone was dressed, each had their own room and bath, and many people brought their own furniture,” she said. McQuade reads voraciously and is currently enjoying a biography of John Adams. She is partial to author John Grisham. She said the people at Queen of Peace have become a new family for her. “We all eat together and the food is very nice. I go to Mass every day that I can,” she told Catholic News Service. The 2015 operating budget for Queen of Peace is $6.6 million, according to Katharine Ogonek, director of development. In addition, $1 million to $3 million is needed for capital projects. While 98 percent of the residents are eligible for Medicaid, payments from Medicare and Medicaid cover only 40 percent of the budget. The rest is raised through parish appeals, direct mail, private donations and fundraising events, including a GermanFest in January. Marianist Brother Michael Gillen accompanied the student volunteers from Kellenberg Memorial High School, a Marianist school in nearby Uniondale. “We’ve been coming here for 26 years. The teens socialize and create a relationship with the elderly and give them the same respect they would want to have,” he said. Kellenberg junior Michael Duffy said, “There’s a school focus on community service and I enjoy it. 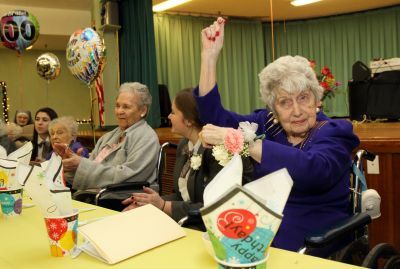 We mostly come here for dances, but also bring presents and joy at Christmas.” Kellenberg partners with Queen of Peace for a “Junior-Senior Prom” in February. 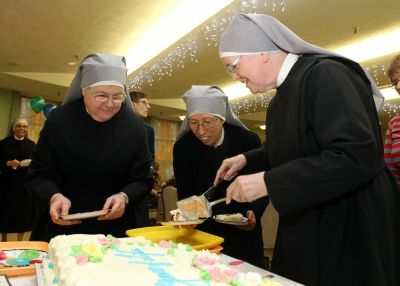 The Little Sisters of the Poor congregation is in a legal battle over its refusal to provide contraceptive coverage to its employees as required by the U.S. Department of Health and Human Services under the Affordable Care Act. Mother Margaret Regina Halloran, provincial of the order’s Brooklyn province, said she hoped they would get a permanent injunction against enforcement of the mandate. “It’s not our life to have to do that,” she said.